After a phase of essential preparations, the People of the Heath project swung into action during June. The project was effectively launched at a full meeting of the Advisory Committee, held in Petersfield Town Hall on 23 June. The Advisory Committee has representatives from all bodies with an interest in the archaeology and management of the Heath (see Project Structure Plan). The Committee’s views were solicited on the varied aspects of the planned programme, including survey work, excavation, documentary research, regional synthesis, public participation, information dissemination and presentation, education and outreach, recording the project, effective management of the sites and other long-term legacies. Some of these aspects will not be particularly relevant until later in the project, but it is never too early to start thinking about best procedures and optimising the benefit to the Petersfield community. A crucial prelude to any modern excavation is detailed survey work. 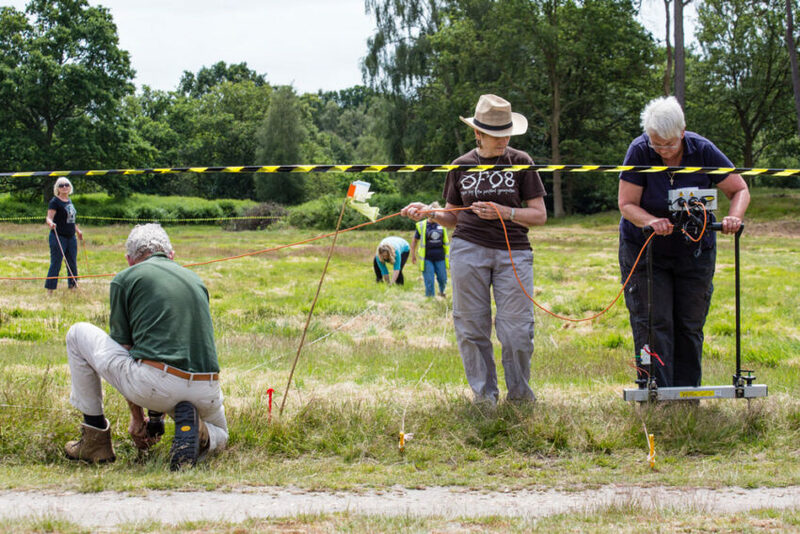 After vital clearance work organised by the Friends of Petersfield Heath, the first fieldwork phase took place 26-29 June – geophysical survey using soil resistivity measurements (the soil conditions on the Heath are not conducive to magnetrometry). Three areas were covered over the four days by a total of 32 people, 15 of whom were doing geophysical survey for the first time. Fears that the recent relatively dry weather might have led to the evening out of soil- moisture variations proved to be unfounded. In fact, resistivity contrasts turned out to be good and the overall plot produced is impressive. Barrow 11 was the focus of one survey; the barrow itself shows two different intensities, dark in the middle, lighter around the perimeter (see illustration; the blue spots are trees) and this may turn out to be related to different materials of construction – we hope to discover this when we cut a trench into the mound later this year. One thing the geophysics will hopefully show is which barrows once had encircling ditches and which not. There is no indication of a ditch around the foot of Barrow 11 and, in fact, after the vegetation had been cut low for the survey it could be seen that the mound was sitting on top of a low ‘platform’ – it may not be artificial, but this too requires investigation. The very dark splodge alongside (on the west) is almost certainly the edge of a tee or green belonging to the former golf course. Just north of the barrow is a thin pale strip marking the line of a ditch which can still be seen on the ground. We also surveyed a possible site picked up from early aerial photographs of the 1920s and later, apparently an oval enclosure (site 24), but very difficult to trace on the ground. The geophysics plot picks it up strikingly, a dark ring (high resistivity readings) surrounded by a light ring (low resistivity). The latter tracks a largely buried ditch, while the dark zone is presumably the remnants of a bank; it is a little surprising that so little material can create such an utterly distinct resistivity signature. The shape of the enclosure actually appears to be a flattened circle, flattened towards the east, rather than a true oval. This does not match any established barrow type and it is probably a ceremonial enclosure or could even be a small domestic site. It is more likely to be prehistoric than later and we hope to explore it during this September’s excavations. A total surprise was revealed to the south-west of site 24 – a faint but definite ditch (very pale tone) curves round and runs out of the surveyed area. In retrospect, we can just see this feature on some early aerial photographs, but one would not wish to have placed any confidence in it without the geophysics data. At present it is difficult to suggest what the ditch represents – whether part of an enclosure or just a relatively modern drainage ditch – and we hope to excavate a small segment. 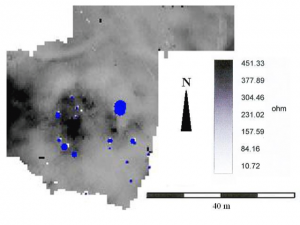 In the future it may be possible to extend the geophysical survey to try to capture the full plan. The third area covered the ground immediately to the west of the nursery school alongside Heath Road East and this had two targets. On top of the ridge is a golfing platform which was constructed in 1900 as a practice green; at that time various flint and stone implements were unearthed (site 23). These are said to be of Mesolithic (Middle Stone Age) date, but this is difficult to verify because their whereabouts is unknown. The geophysics showed the old green to be split sharply into a zone of low resistivity and another of high resistivity. It seems most likely that these relate in some fashion to the soil foundations laid in 1900, but even so the contrast is odd. Excavations will test the area of the green to see if any evidence of the flintwork site survives, but will also investigate the rising land to the west which appears to be undisturbed and is more promising. A mound (site 22) sits on the slope just off the crest of the ridge and this was also taken in by the geophysics survey. The mound is intriguing because it has never been classified as a barrow and yet neither is it an obvious golfing feature such as a tee, green or bunker. It is possible it might be spoil dumped from the site 23 practice green, but if so it forms a fairly neat circular mound. Clearly we need to investigate whether it is an additional ancient barrow, hitherto overlooked. Although the soil resistivity of the mound is a bit patchy, most has an above-average resistance, hence showing dark on the plot. The next stage, again ahead of the Petersfield Heath barrows excavations planned for 9-27 September, is for the topographic surveyor to cover the part of the Heath in which the above-described sites lie. Later, when the vegetation has died back, the surveyor will return to add the rest of the Heath in one or more sessions. His survey will for the first time plot the exact shape of mounds, highlight any subtle features in the landscape, and show the positions of sites in relation to the gentle topography of the Heath. In the context of this survey we offer special thanks to Petersfield Town Council and Councillors, and to Vivien & John Pike and other members of the Friends of Petersfield Heath who pulled out the stops to organise and undertake the necessary scrub clearance at short notice. The latter operation involved the valuable services of Harry Caines, who topped the difficult tussock grass for which we are grateful. We owe some superb first results to the expertise of Neville and Mary Haskins, leaders of the project’s Geophysics arm, and of course to all those who volunteered to stumble across hummocky terrain. Nothing could have been achieved without the loan of survey equipment and advice from Andy Payne at English Heritage, and the Chichester City Walls Project Trust, via James Kenny; our thanks go to those institutions and individuals as well. We are using a technique called earth resistance monitoring. The resistivity meter measures how well a small current flows through the soil. This depends on the amount of moisture in the soil. Stone walls and dry areas do not contain much water and show as black areas. Silt filled ditches tend to hold more water and show as white or pale features. Our survey in June showed these sort of features around one of the larger barrows. The top of the barrow shows dry areas where the water has percolated away whilst the base is brighter indicating an area of different composition which shows as a lighter ring. The blue dots indicate the positions of trees. We will be carrying out further surveys on barrows across the Heath so if you would like to join in please contact us.